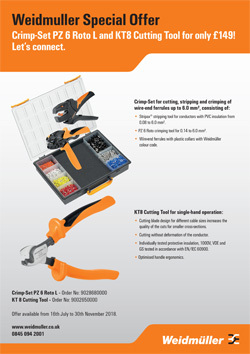 Until the end of September, get a Weidmuller Crimp-set PZ 6 Roto L kit (Stripax stripping tool, PZ 6 Roto crimping tool & wire-end ferrules), with a Weidmuller KT8 cutting tool for just £149 (usual price £228.59). We give you everything you need to cut, strip and crimp wire-end ferrules up to 6.0mm2 and save you 30%. It's a great opportunity to buy top quality, high-end tools that will last for ages, but at low-end prices. Ideal for crimping in hard to reach places, with a rotating die which can accept ferrules from either side or front. The PZ 6 Roto also has a ratchet for precise crimping. Stripax saves time by stripping and cutting insulation and sheathing, with just one tool. It also provides consistent stripping which helps ensure a safe elecrical connection. Easily cuts cables up to 16mm2 without deformation of the conductor. Optimised handle ergonomics and specially designed cutters minimise the effort required. Wire-end ferrules with plastic collars. Weidmuller colour code. There isn't a single part number for this offer. Both part numbers; 9028680000 (Crimp-Set PZ 6 Roto L) and 9002650000 (KT 8 cutter) must be purchased together for the special price of £149 + vat. Note: offer ends 30th November 2018. Give our head office sales department a call on 01254 685900 or e-mail sales@lca.co.uk to place your order. The parts included are the Crimp-Set PZ 6 Roto L (9028680000) and a KT 8 (9002650000) only and can be bought together for £149. Both parts must be ordered together on a one to one basis and cannot be split for resale. This special offer will run only until 30th November 2018. The offer is not available via non franchised partners. Orders should be placed clearly stating that they are part of the offer – “Tool offer 2018” and should show both parts.